With the recent trend to ditch the old and boring carpet, many people have wanted that "IKEA" finish which produces the modern and sleek lines that Scandinavians have enjoyed for many years. To suit this change in needs, wooden flooring has become a common feature in homes everywhere. However, the cheap and cost effective woods that are often used tend to have many attributes that do not allow for durability and still be able to maintain a good finish after a number of years. This is where bamboo flooring comes in. The bamboo plant from which the wood comes from is mainly from China or other areas of Asia, where bamboo grows commonly. Its great trick is to have many of the traits of a hardwood whilst still being a softwood and enjoying the many advantages that brings. Due to the way that the bamboo wood is structured, its close knit fibres ensure that it has strength and durability whilst having being a softwood. Its application as a wood for flooring comes into its own when applied in humid or damp environments where the bamboo can be resist moisture as well as insects that might find their way in. There are a range of different woods which are categorised in order of strength. The lowest rank strength is 1180 called carbonised. It then ranges through 6 other categories to the hardest called Hickery (1820). The most common type of bamboo floor available uses the thinnest possible strips of bamboo which are then cut as thin as possible. Once they have been sourced and cut they are then given some form of treatment, usually a stain or varnish which also gives the extra strength as well giving them their finished look. It is possible to simply use the bamboo as is, but is often not preferred. Once they are individually complete, they're then nailed or fixed down to wooden beams. 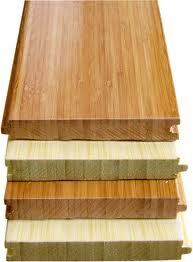 Another type of Bamboo flooring is most commonly found in North America whereby the process is highly manufactured. Once cut to the desired length and width, the strips are then placed a boiled solution of boric acid or lime which removes any starch left in the bamboo. After is it dried and planed, it will go through a carbonizing process of steaming which has the effect of changing the bamboo's colour to a brown without using varnishes or stains. After this carbonising process is makes the bamboo softer than before which affects the final hardness of the floor, therefore it is a consideration that must be taken depending on the context in which the floor will most of often be used. This process also uses a laminate that induces poor indoor air quality due to the chemicals given off during the process, so again consideration of the type of room the floor is going to be used in is essential. The eco friendliness of bamboo has been widely advocated during recent years as an easy renewable material. It grows faster than wood and once harvested, the root system is left intact so it continues to grow without the need for replanting. It doesn't come cheap however, as the very best hardened bamboo floors come at a price compared to the average hardwood used in most wooden flooring. A good tip is to check the wood but using a coin to scratch the surface to see if some of it flakes off. Also, you can use a fingernail to try and make a dent, if it does, then the floor will unlikely last beyond a few years of normal use before it needs to be refinished.